The global mobile VPN market will reach USD 2.3 billion by 2024, growing with a CAGR of 17.9% during the forecast period. The growth of this market is attributed towards increasing emphasis of business organizations towards increasing demand for remote accessibility, accentuating cyber threats and increasing demand for protected wireless accessibility to critical uses. An effective mobile VPN system provides assurance to its users pertaining to privacy and security of their data. On the basis of distribution channel, mobile VPN market is segmented into VARs, direct sales, online and partners or distributors. Among these channels, partners or distributors account for the largest share in the market as it provides improved on-premise services to the users which is considered to be the most crucial source for these offerings across the globe. Based upon end-users, the mobile VPN market is segmented into military, telecommunications, healthcare, mining, financial, government, utilities, oil and gas and others. 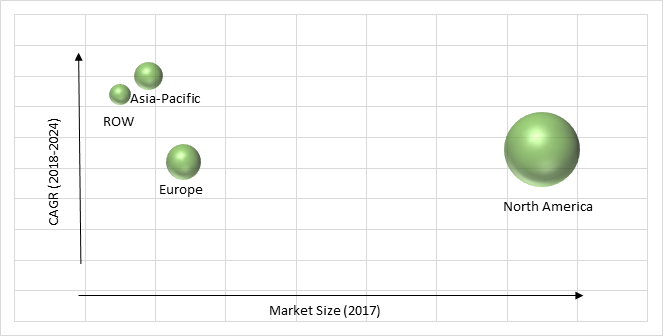 Among these segments, telecommunications domain is the largest contributor to the global market and is also expected to witness significant growth during the forecast period. The increasing utilization of wireless and mobile devices across the globe has further accentuated the demand for VPN among utilities, banking and healthcare domain. The major factor that is driving the growth of the mobile VPN market include the increasing requirement for remote accessibility that is up scaling the demand for continuous and secure access for vulnerable data to various business enterprises across the globe. The increasing trend of employees working from any location or on the field has enhanced the demand for internet to function through wireless technique that further enables the user to download any application on the mobile device. The utilization of wireless devices has enabled the business organizations to enhance their productivity and escalate efficiency of their business operations. The use of mobile devices is not confined to window devices, the employees are also using blackberry, android, iPhone and Mac that helps in connecting business network that has bolstered the need for mobile VPN products and services across the globe. Furthermore, increasing cyber threats across the globe is another factor that is leading to the growth of mobile VPN market globally. High cost of mobile virtual private network along with less awareness regarding mobile security solutions in emerging economies is the major factor that is hampering the growth of the mobile VPN market. Globally, mobile VPN industry players are leveraging market growth through aggressive investment and development of cost-efficient security systems in a mobile. Moreover, technological upgradation and mergers and acquisitions among key players is accentuating the growth of mobile VPN market across the globe. Geographically, in North America has been contributing largest revenue in the mobile VPN market throughout the estimated period and also expected to remain the largest market during the forecast period due to excessive adoption of mobile devices in this region. The business organizations in this region are utilizing mobility that helps in improving productivity and enhancing overall experience of customers. Moreover, mobility helps in decreasing service costs by minimizing errors, streamlining business operations and eradicating redundant item. Moreover, the mobile VPN market in Asia-Pacific is expected to witness highest CAGR of during the forecast period. The extensive demand for these products and services in the region is due to various benefits provided by these systems to the users such as strong encryption systems that helps in developing confidentiality of data at the time of transmission of data that is considered to be vital for both public and private business enterprises. 10.1. Smith Micro Software Inc.
10.4. Radio IP Software Inc.
10.6. Anthasoft S.A. De C.V.
Table 90 Snapshot – Smith Micro Software Inc.
Table 93 Snapshot – Radio IP Software Inc.
Table 94 Snapshot – Cisco Systems Inc.
Table 95 Snapshot – Anthasoft S.A. De C.V.
Table 97 Snapshot –Netmotion Software, Inc.